With 69 per cent of children under the age of 10 affected by sleep problems that can lead to mood swings, behavioural disorders and irritability, good sleep plays a major part in their wellbeing. 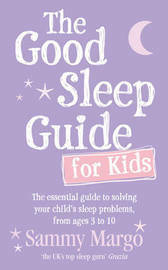 In The Good Sleep Guide for Kids, Sammy Margo addresses problems such as night waking, sleep terrors and sleep walking and offers sound advice on ensuring the best quality sleep for your child. With expert guidance on bedroom environment, bedclothes, bedtime routines and foods that help and hinder sleep for children, Sammy also looks at issues such as-- sibling relationships- comfort toys- napping- co-sleeping with parents The Good Sleep Guide for Kids offers a simple, positive approach to solving sleep problems and creating the best environment and routine for restful, satisfying sleep every night. Sammy Margo has been a physiotherapist for more than 15 years and has built up her clinic over the past 10 years. She trained at West Middlesex University Hospital and subsequently did a Masters in Physiotherapy at University College and Middlesex Hospital. She is also a qualified Pilates instructor and incorporates this 'balanced body' approach into her physiotherapy treatments. Sammy is actively involved in the media, including television, radio, newspaper and magazines, whilst still maintaining her clinical input.